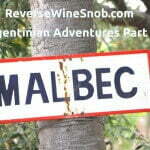 A popular budget Malbec from Argentina, but does it measure up? 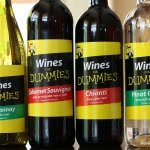 We found this wine at a local retailer (MGM) on sale for $7.99, but it can be found everywhere for $9.99 or less. 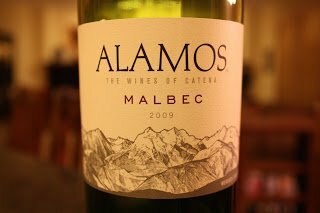 Alamos Malbec is sourced from grapes grown on the lower Eastern slopes of the Andes Mountains in Mendoza. 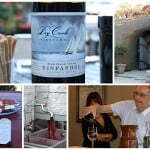 The Catena family has been making wine in the region for more than 100 years. Today, Catena is acknowledged around the world as being a pioneer for quality Argentinean wines. 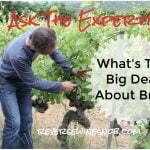 All vineyards are hand-harvested. At the winery, the grapes are hand sorted before being assembled into each Alamos wine. 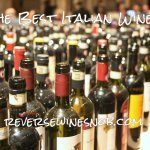 This balanced and full-flavored wine is excellent with chicken, lamb, grilled vegetables and pasta dishes. Our opinion? This is a dry, thin, below average Malbec. We found it be a bit sour and are somewhat mystified about the popularity of this one. Luckily we drank it while watching a really good movie (Secretariat) so all was not lost. Because we were able to get this one for only $7.99 it will just barely get a Second Chance rating, but if you have to spend more than that, our advice would be to Skip It.